As one of Australia’s leading bolts, nuts, and stainless steel specialty fastener suppliers and manufacturers, reliability and consistency run through the core of our business. 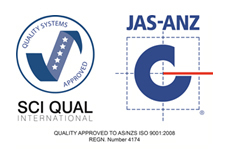 Recognition as a Queensland Government quality assured supplier means that our quality management system conforms to all Australian requirements. Prendergast Fasteners’ range of specialty fasteners, metal thread screws, square head bolts, anchor bolts and other Brisbane-made products are manufactured to relevant Australian or corresponding international standards. We will supply letters of conformity specifying that our products are compliant with Australian standards upon request. Furthermore, we are also able to provide mill certification, chemical analysis, and mechanical tests as required. Learn more about our extensive range of bolts, nuts and studs, screws, and other complementary products on our Products page. Our friendly and experienced team is available to consult with clients and can assist with product information. We are committed to our customers and endeavour to enhance their understanding and knowledge about fastening, fixing and related areas. If there’s an item you’re looking for that doesn’t appear on our website, or products that you are unsure of, do not hesitate to give us a call. All certification is available upon request before the Brisbane manufacturing of anchor bolts or other products begins. Give our team a call with any of your queries at 1800 074 094 or get in touch online.